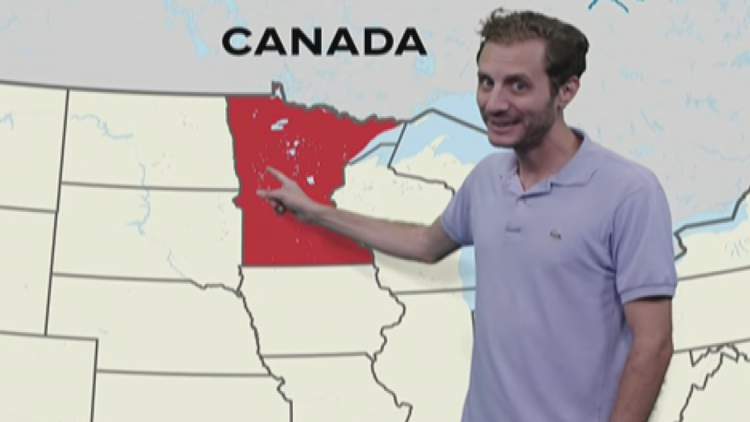 "I'm from the state filled with all the lakes, strangers always wave like they know ya," sings Alex Frecon in the music video, "I'm From Minnesota." From tater tot hotdish to Post-it notes and Walter Mondale—a music video dedicated to all things Minnesota is racking up tens of thousands of views online. Alex Frecon, a hip hop artist and writer from Minneapolis, made the video "I'm From Minnesota" with his friends Collin Goodspeed and Kolter Ridge as a tribute to our great state. They released it online last week. Frecon said the idea to write a song about Minnesota comes from when he went to college out East. "I met all these kids from New York or LA or Boston and whenever they asked where I was from I'd be like, 'I'm from Minnesota.' And they'd immediately jump into these crazy, ridiculous questions," Frecon recalled. Frecon decided it was time to set the record straight. "I had this line in the song like, 'Most people think we're a flyover state but when you think about it, that's probably why it's so great.' And I think there's a lot of truth to that because being under the radar isn't necessarily a bad thing," Frecon said. The lyrics touch on everything from pop (not soda), to Duck Duck Grey Duck, to lake life. "A lot of people asked me, 'There's no winter shots... what's the deal? And I wanted... that's such a perception of Minnesota. It's so cold. I wanted to show the opposite of that because the summers here are awesome," Frecon said. Frecon finished writing the song in late July; they shot the music video after that and you might recognize some familiar faces. KARE's Cory Hepola and Camille Williams appear in the video, as well as Minnesotan and Super Troopers star Erik Stolhanske, and former Twins MVP Justin Morneau. As of Sunday night, the video had 80,000 views on Facebook. "It's a really humbling feeling to know that we made something that people can enjoy and use it to be proud of where they're from," Frecon said. Frecon works in advertising but this is not the first time a video of his has garnered attention. He made headlines earlier this year for his video on playing hockey in North Korea against the North Korean Men's National hockey team in 2017. That video on YouTube has nearly 250,000 views. He also made a video in 2016 called "Cake Eater Anthem," which was a song poking fun at Edina. Before working in advertising, Frecon was a full-time musician. Frecon said, "I love telling stories. I think the world is full of interesting stories, interesting people, and it's such a fun challenge to try and put something together that tells a story that people can enjoy and share." You can watch the full video called, "I'm From Minnesota," here.